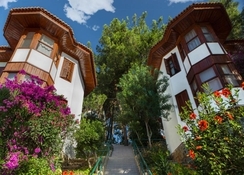 The Club & Hotel Letoonia, Fethiye is situated on a peninsula of land overlooking the bay and town of Fethiye in South West Turkey. Views of both the bay and the South Aegean Sea are magnificent from the vast grounds which feature a multitude of facilities and sports for guests to enjoy. 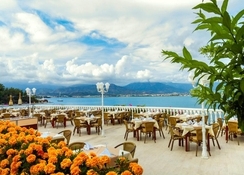 The luxurious resort of Club & Hotel Letoonia, Fethiye is ideal for families, couples and/or groups of friends with its numerous bars, restaurants and snack bars. A comprehensive list of land and water sports and activities are available as well as the Spa and Wellness Centre offering a fantastic variety of therapies and treatments. Children are well looked after by trained staff and entertained by activities throughout the day and evening. 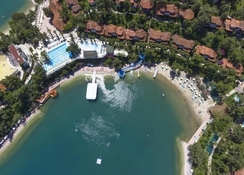 The complex of Club & Hotel Letoonia, Fethiye is set amongst idyllic surroundings on a small peninsula of land south west of the blue waters in the bay off the port city of Fethiye. The landscaped gardens and forests around the hotel include a rich variety of wildlife attracted by the flora and fauna and are superb for walking, trekking, jogging and cycling and there is even an annual Marathon held here every September. The beaches are typically sandy with a shingly seafloor - the nearest beach is only a few minutes’ walk. The resort village of Ölüdeniz and blue lagoon of the national reserve are 10.3 miles to the south. Dalaman airport is 34 miles along the coast road to the west. The décor in all rooms is completed to a high standard in subtle colours and plush furnishings with a comprehensive range of features which will ensure all needs are met. Ideally the hotel room is able to sleep two adults and one child, whilst the Bungalow Room and Bungalow Jr Suite Room, both with carved wooden ceilings, are perfect for two adults and two children or three adults and one child. Rooms feature a satellite TV, minibar, safe, air conditioning, shower and WC and kettle and are maintained via the daily house-keeping service. The wonderful variety of flora and fauna is evident from the balconies. 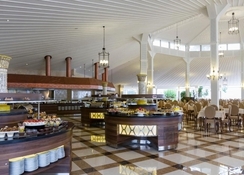 Guests have an amazing choice of options at the Club & Hotel Letoonia, Fethiye. There are three restaurants each set in their amazing surroundings. 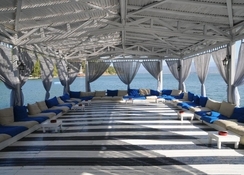 The Moonlight and Marine offer an open buffet and the Lykia offers an open buffet and international cuisine. A children’s menu is available in these restaurants. To compliment these, there are also snack restaurants offering salads, burgers and ice creams and three à la carte restaurants. 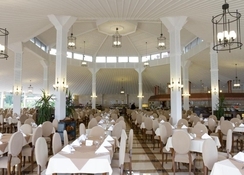 The Dolphin restaurant specialises in seafood, the Kebabçı restaurant offers Turkish cuisine and the Panorama restaurant serves Asian cuisine and sushi. All three à la carte restaurants require reservations and are subject to additional fees. There is an abundance of sports, activities and entertainment at the hotel. 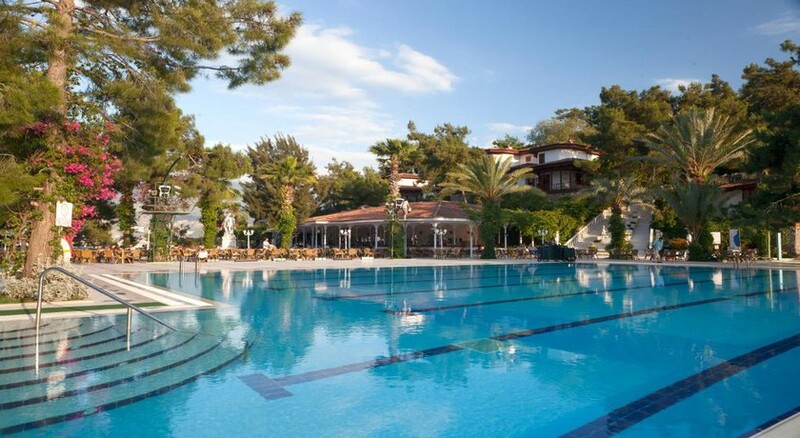 The Club & Hotel Letoonia, Fethiye has three outdoor pools, two of which have dedicated children’s sections. In addition, there is another pool just for children. For additional amusement there are three watersides suitable for both adults and children that descend and exit into the sea. Other sporting activities available include archery, basketball, step and aerobics, mini golf, mini soccer as well as a junior club and children’s games. Watersports are available on the beaches. Included in the complimentary activities are polo, surfing, sailing and canoeing. Other watersports such as water-skiing and paragliding are available for a charge. In the evening there are theatre shows followed by beach parties and open-air moonlight discos. This was my 2nd stay at this beautiful resort and I think I loved it more than the first time. From the beaches, the food, the staff, the accommodation - it's just magical. And I'm going again next year- this time with the kids! Had a fantastic time. Facilities,food, location, staff,accommodation was all top notch. Would definitely recommend Letoonia. I cannot daily this hotel when we went in October half term week. Super location and friendly staff. Entertainment all there if you wanted it and plenty to do off site as well. Lovely apt. Not suitable for elderly or pushchairs as we were high up. Must ask for ground floor apt.